If you were lucky enough to get a ticket to this year’s Northwest Horticultural Society Symposium (it’s a sell-out event every year! 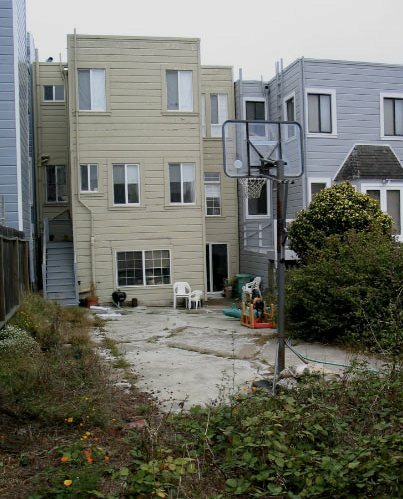 ), you were also lucky enough to hear about and see the work of Alameda, California based artist and landscape designer, Shirley A. Watts. Her ability to find a new purpose and life for objects headed for, or in many cases already in, the garbage bin, is inspiring. 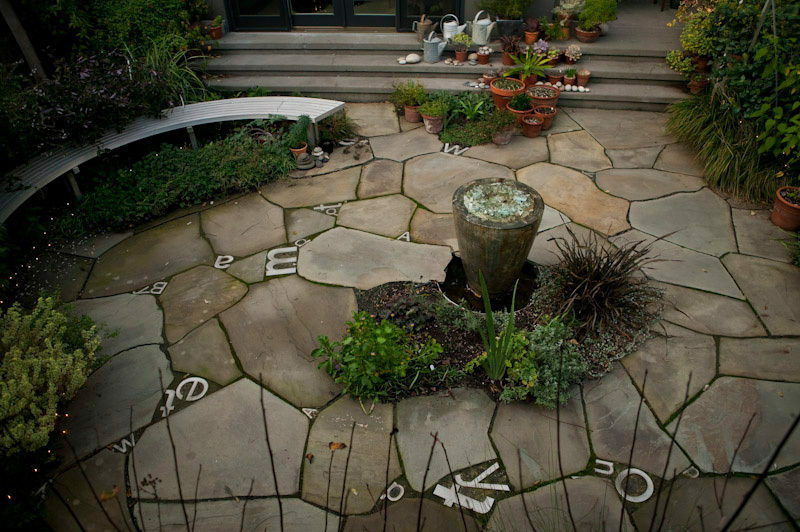 For example, the recycled letters above used in the patio for the Rose Street Project. When viewing or experiencing one of her finished gardens, it’s common to think, “well of course, that’s a perfect use for that piece…”, but to see the potential in the object in the first place, is a gift and a rare and unique way of looking at the world. 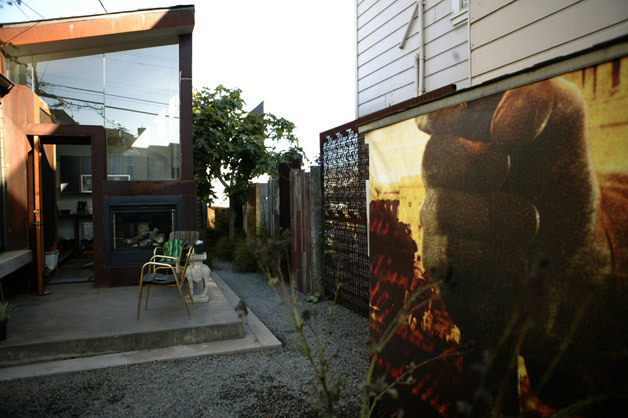 The Congo Street project in San Francisco’s Glen Park neighborhood is a prime example of Watts’ ability to re-purpose materials in a creative and compelling way in a small space. 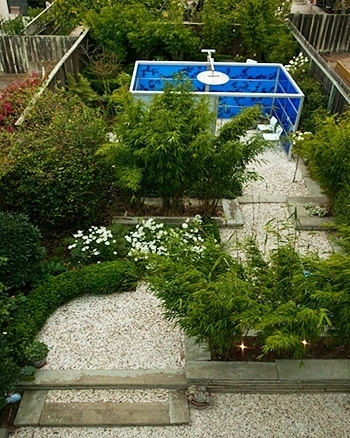 This garden only had 700 square feet of usable space. 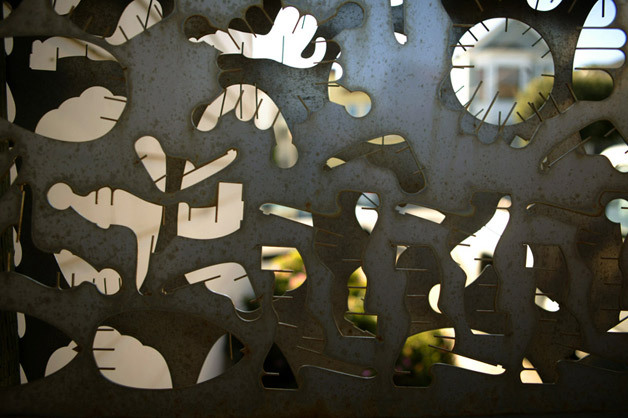 She used industrial laser-cut metal cast-offs called skeletons as fence material. The cut-outs allow light to pass through while still providing privacy. The gate was placed on rails so it could slide horizontally to conserve space rather than swing open and closed in a conventional way. She also tracked down second-hand billboard advertising vinyl of Big Ben, Orlando Bloom’s eyes and Gandalf the wizard and used them as “intense forced-perspective” along the fence line. 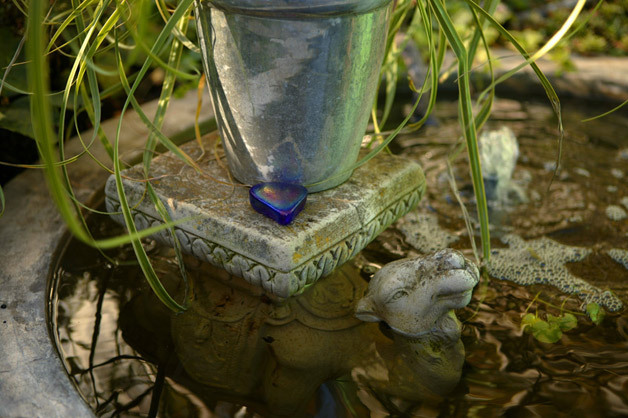 A found camel sculpture was submerged into a fountain and used as a pedestal for potted plant. Another example of her innate ability to see uses for objects beyond their original intent was for a project on Atherton’s Shelby Lane. 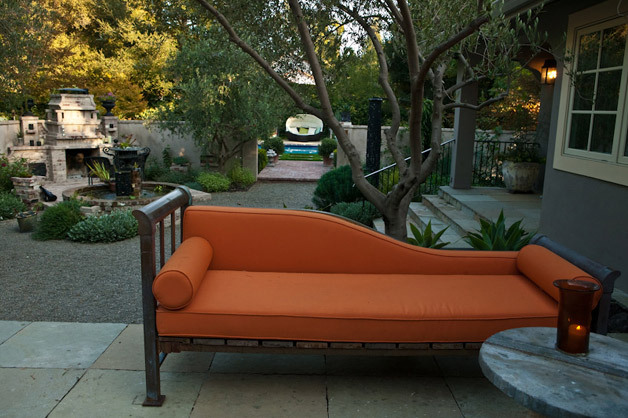 Watts converted an antique brass bed frame into two seating lounges by sawing the bed in half. 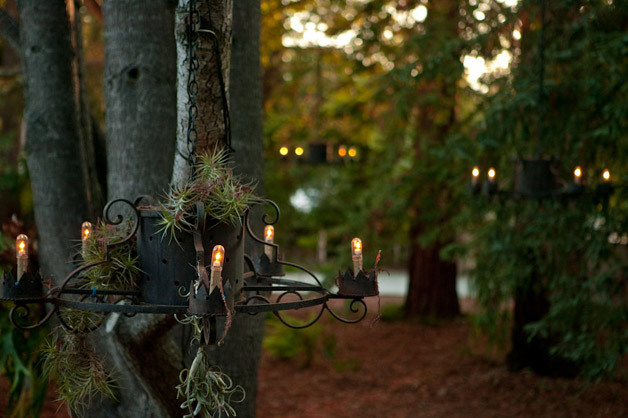 In the front yard Watts designed and built gothic-style wrought-iron chandeliers adorned with tillandsia that she then strung through the mature fir and redwood trees to create an enchanting twilight scene. 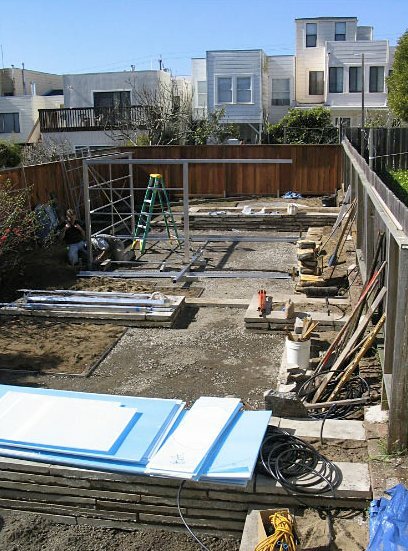 For the Pleasure Garden project in San Francisco’s Sunset District, the owners approached Watts with an overgrown, cracked concrete covered backyard as a blank canvas. 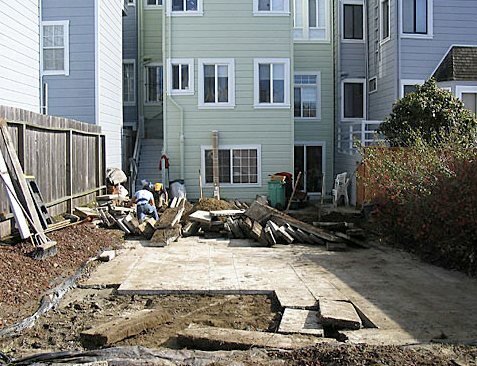 Instead of breaking up the concrete and hauling the material to the dump, which would have been not only wasteful, but would have required going through the house and out the front door due to absence of side lot access, she decided to have the concrete saw-cut into workable rectangular slabs. 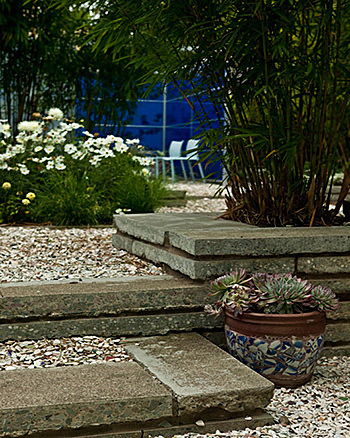 The slabs were then stacked through-out the space to create raised planters, walls and steps that established the framework for the garden. 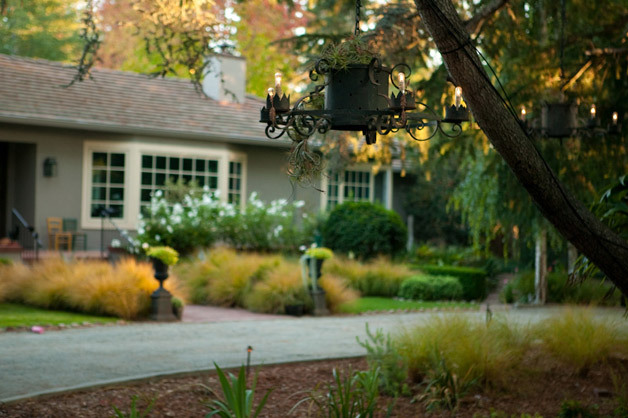 What resulted was a thoughtful layout with clearly defined spaces for plantings, entertaining and meandering. Through her ability to incorporate art, found objects, plant material and keen sense of space, Shirley Watts seems to approach every new project as an opportunity to create a truly unique and personalized space for her clients. It’s this ability that I find most inspiring and what will continue to have a Big Impact on not only me as I grow and evolve as a designer, but the landscape design community as a whole.